Volkswagen Jettas aren’t usually among the most exciting cars you’ll see. Sure, the old A1s and A2s can boast a certain ex-Soviet cool, but much of the car’s history is wall-to-wall beige. This 500bhp monster is like finding a steaming-hot pizza where your corn flakes used to be. 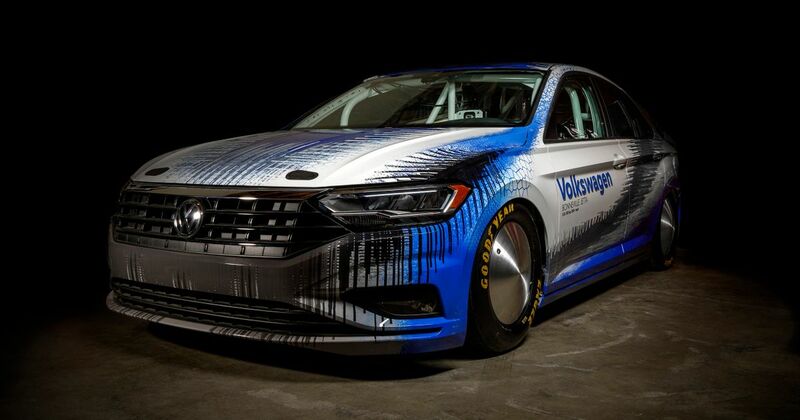 This stripped-out and tuned-up saloon built in collaboration between Volkswagen and THR Manufacturing has been built to take a swipe at the existing BGCC class record at the Bonneville salt flats. It’s a marketing stunt to promote the virtues of the all-new Jetta, whose predecessor had gone far too long without any meaningful upgrades. The class record this Jetta has to beat is all the way up at 208.572mph. To make that kind of speed possible the standard 2.0-litre EA888 engine block (from every Golf GTI since 2008) has been fitted with upgraded internals and a larger turbocharger to boost peak power to something ‘over 500bhp.’ Nice. Naturally the gearing has been raised to suit the target. Internally pared back down to the dashboard, steering wheel, pedals, a lightweight bucket seat and the essential safety gear, this lowered rocket ship has special aerodynamic wheels and tyres better suited to the salt flats, plus a casual pair of parachute brakes. 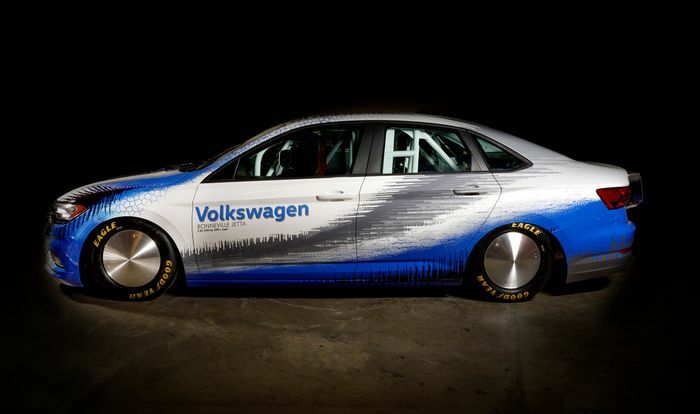 Volkswagen will have a week to break the record during the Bonneville Speed Week of 11-17 August. Barring any catastrophic crashes, we can’t see it leaving empty-handed.